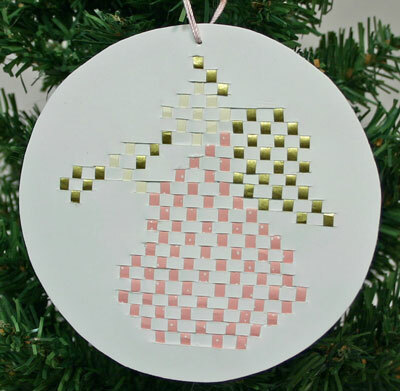 This angel uses the same pattern and the same technique as illustrated in our Woven Paper Angel project. The only real difference is the size and the materials used. The pattern was reduced when printed such that the circle was four and a half inches in diameter. From there, the steps remain the same. The background paper is white, matte photo paper. Strips of gold wrapping paper make the angel’s wings, halo and horn. Cream colored presentation paper was used for the face and hand. Strips of white dotted pink paper make the angel’s robe. Two pieces of pink yarn form the hanger for the angel. Though not necessary, tweezers are very helpful when weaving the strips of paper back and forth through the white background. In particular, this bent end tool helps when weaving the strips. Enjoy making the larger version or reduce the pattern to make a smaller angel. 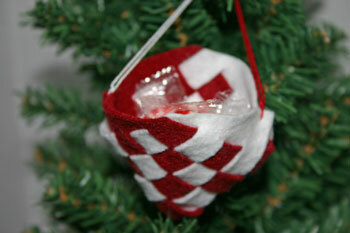 We’ve added two new ornaments to our Easy Christmas Crafts section: a felt basket ornament and a paper basket cone ornament. These two ornaments use the same basic steps and very similar tools applicable to the two different materials – felt and paper. These simple projects provide fun and accomplishment for all ages. Plus, the inexpensive materials allow you to make a few or many. The results can be gifts from the heart to friends and family. 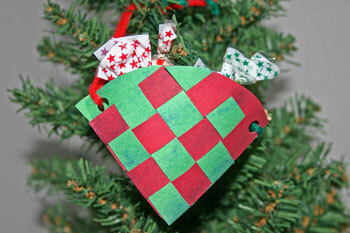 Plus, children can feel important and special as they make these to hang on the tree or give to others. Take a look at the other versions along with the easy how-to steps on the funEZcrafts’ felt basket ornament and funEZcrafts’ paper basket cone pages.